This is a heartwarming compilation of stories by an amazing advocate for animals. It is highly recommended. The title of this book says it all! 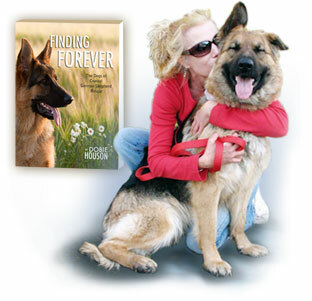 Once again Dobie Houson shares how meaningful animals are to our lives with her beautifully written stories of the bonds between humans and their faithful companions. Her caring style of sharing these stories will bring your emotions right to the surface as you read about the laughter, joy, and even grief that can only be experienced when two souls have a complete and trusted connection. This is an amazing read, I recommend this book to all animal lovers and anyone that has had a pet in their life time! The book leaves you with a whole new outlook towards the way we see our pets! This author has a wonderful gift and is sharing her talents through the stories! Animal lovers everywhere would love this book. Dobie Houson has an amazing gift and is able to capture the essence of that magical bond between humans and their animal companions. Each story is touching, emotional, entertaining and heartwarming–a must read for any animal lover! He was a handsome youngster with a longish snout, long ears, and even longer legs. Pregnant and stranded in a high-kill shelter, Gem’s transition to motherhood was a challenging one.